After the submission deadline has passed, authors can no longer submit. 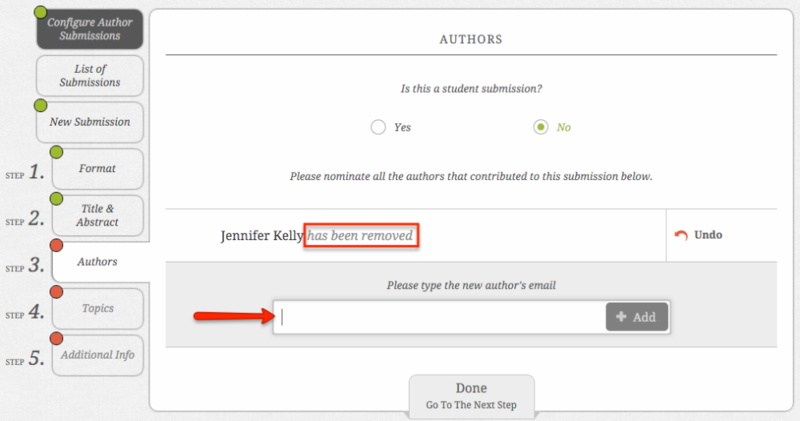 An administrator can submit on behalf of authors after the deadline if needed. 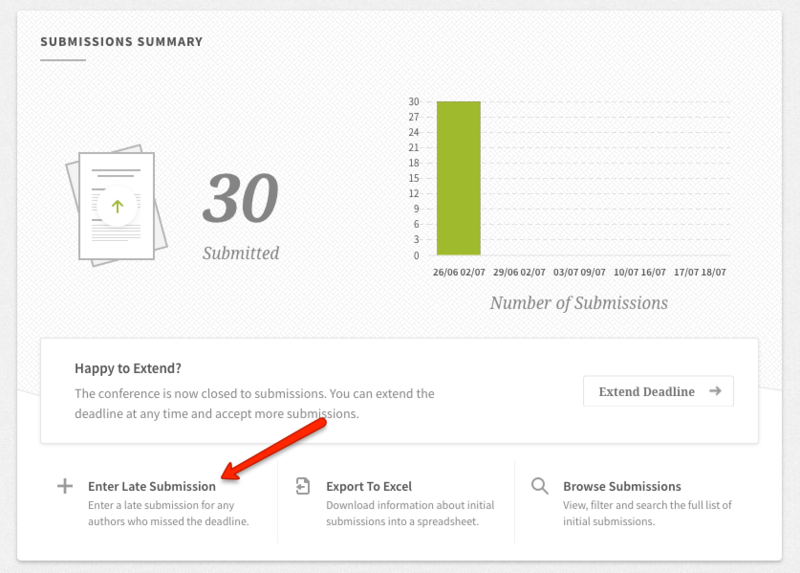 Find your Submissions Summary card on your dashboard and click on 'Enter Late Submission'. To add a late submission, you will need to follow the required steps. This means that you'll need to make sure the authors have given you all of the information about their submission (this depends on the requirements of your conference). What track (if applicable) the paper will be submitted to. The title of the submission and its abstract if you're collecting short abstracts. If any formatting is needed such as bold, italics or underline, see our article on how to use the text editor here. The authors on the paper (their email addresses, name, prefix, affiliation and country). The topic(s) they wish to submit that paper to. Any relevant files (if collecting papers or extended abstracts). As you are logged into the system, the system at first recognises you as an author on the paper. To ensure that you are not erroneously listed as an author, you will need to click on the ‘I’m not an author on this paper’ button. This is in grey text on the author page as shown below. 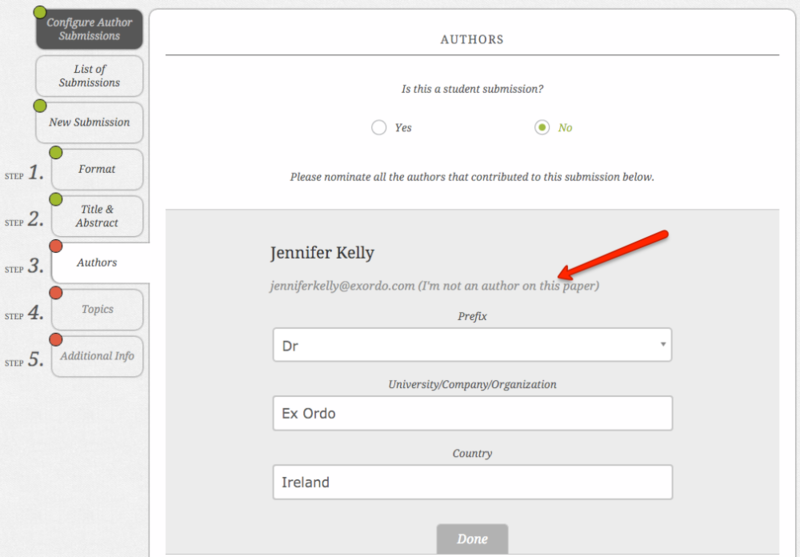 You will then see that your name was removed from the submission and you can now enter the email address of the actual first author in the field below. Once you've added the first author, you will then be able to add any further authors on the submission or proceed to the next steps. Once you have completed all the steps of the submission process, you will be able to see that all of the red dots on the left will change to green. To finish, click on the 'Save Submission' button on the last page.